Dr. Edwin D. Kilbourne, a medical researcher who figured out how to outwit fast-evolving flu germs, developing a new vaccine each year by intermingling genes of different disease strains, died Monday in Branford, Conn. He was 90. 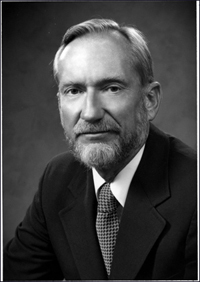 I’m saddened by Dr. Kilbourne’s passing – he was the Chairman of the Department of Microbiology at Mt. Sinai School of Medicine, New York, during the years when I did my Ph.D. research. Dr. Kilbourne had many accomplishments during his research career, but three stand out in my mind. First, he devised a method for producing high-yielding recombinant vaccine strains. The seasonal influenza virus strains often do not multiply well in embryonated eggs; he solved this problem by crossing them with a virus strain, called PR8, known to propagate well in that host. Such strains were produced by co-infecting cells with the seasonal strain selected as a vaccine candidate, and the PR8 strain. Viruses selected for vaccine production inherited two RNA segments from the seasonal strain – encoding the HA and NA glycoproteins – and the remainder from PR8. This method is still used today in influenza vaccine production. I also recall Dr. Kilbourne’s role in the swine influenza immunization of 1976. Two years after I joined the Department of Microbiology, an outbreak of swine influenza was identified in Fort Dix, N.J. At the time it was believed that a swine virus had caused the 1918-19 influenza pandemic. Therefore scientists were concerned that the virus had returned to Fort Dix and would soon cause another catastrophic outbreak. Dr. Edwin Kilbourne and others convinced the US Public Health Service to conduct an mass immunization campaign against the virus. The third event that stands out in my mind is more personal. I had befriended Dr. Kilbourne’s son, Ed, while attending Cornell University from 1970-74. In the summer of 1975 I visited Ed at his parents’ home in northern NJ, and after dinner Dr. Kilbourne joined the conversation. He asked me what I planned to do with my life, and I told him that I wanted to study microbiology, but I was not sure where I should do that. In fact I had applied, with little direction, to a few local colleges to earn a masters degree. Dr. Kilbourne said, without hesitation, ‘You should get your Ph.D. at Mt. Sinai’. The next day I applied to the program, was accepted, and began my Ph.D. studies in the fall. The next year I joined Dr. Peter Palese’s lab and began my career in virology. I remember that Dr. Kilbourne always wore a tie and laboratory coat, and that he brought his lunch on a cafeteria tray to department seminars. I’ll always remember and appreciate the excellent career advice that he provided to me. Update: I remembered today that I once had the occasion to sit next to Dr. Kilbourne on an airplane, returning home after a scientific meeting. When he ordered a martini he seemed slightly embarrassed. He looked at me with a mischievous twinkle in his eye and said ‘You’ll find as you get older you will need one of these at the end of the day”. I attended Cornell from 1969-1973 along with my cousin Edwin. Thank you for posting this. My Uncle Edwin was a great man who devoted his life to his work and his family. He spent 65 years working to make this world a better place, and the New York Times took one miniscule piece of that time, when he had the best of intensions and did what he thought was right and made it sound like that was it! That was not his only contribution to the world. He was a great teacher, writer, scientist and family man. He wrote poetry, literature, music, and scientific articles and unravelled much of the mystery of virology and microbiology. He will be greatly missed.